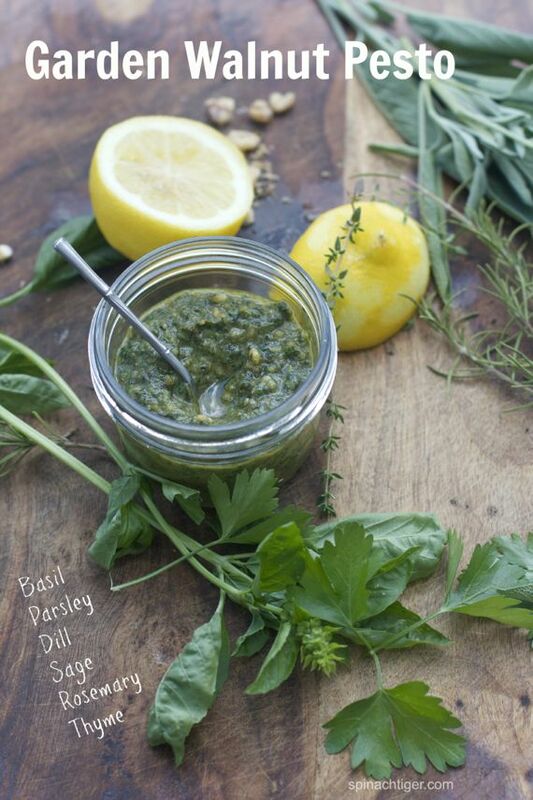 Garden Pesto with walnuts and seven herbs great for fish, toast, pasta and more. Put herbs, salt, pepper, lemon juice, walnuts in food processor, adding oil a little at a time, pulsing until the pesto is chunky but mixed well enough to spread. Don’t over mix. Stir in lemon zest at the end. Recipe Notes: This can be made with just basil or a mix of basil and parsley. Use the additional herbs if you happen to have them on hand, and only in small amounts. Be sure to chop the chives very fine by hand before adding to the pesto. The pesto can sit outside of refrigerator for several hours, but do refrigerate overnight.